Fish and chips have been part of our nation’s culinary heritage for more than 150 years and we believe proper Yorkshire fish and chips deserve a place on the gourmet map of Britain. 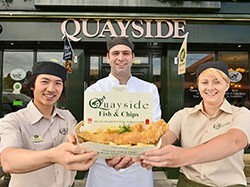 Quayside is proud to serve this uniquely British dish. The following dishes are deep fried in the traditional Yorkshire way in quality beef dripping, coated in our own special recipe batter and served with lemon and chipped potatoes, unless stated otherwise . 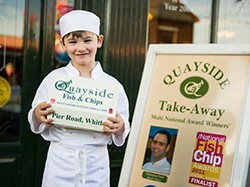 Gluten Free/Coeliac disease – We can fry any of our fish in Gluten Free Batter. (Please note – not scampi or fishcakes). You don’t have to book, just order your meal at the counter/table and be clear to your assistant, and we will fry it while you wait. 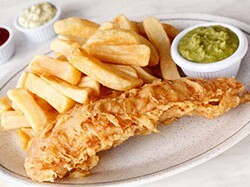 A succulent piece of golden, deep-fried cod. Fresh fillet of haddock (skin on), fried to perfection. 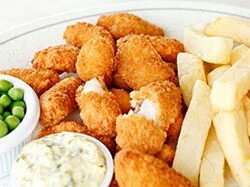 Whitby whole-tail scampi coated in breadcrumbs, served with our own tartare sauce and salad. 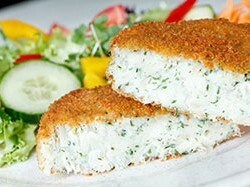 Our own legendary home-made cod fishcake, coated in breadcrumbs and served with sweet chilli sauce or hot parsley sauce. Home-made with fresh cod, prawns and salmon in a delicious creamy sauce topped with mashed potato and melted cheese. Suitable for children aged under 10 years only. 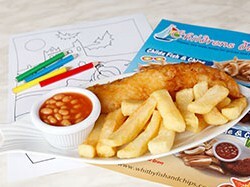 Served with chips and a choice of beans or mushy peas. 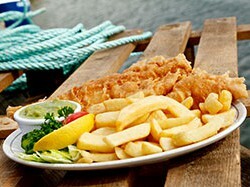 A child-size piece of delicious cod in our special batter. Chicken breast coated in batter. Premium pork sausage coated in our special batter.